Coming off a big debut that led to a Fiesta Bowl victory over Arizona, even greater things were expected of Bryan Harsin's second season at Boise State. The former Arkansas State head coach oversaw some controversy at QB to begin the year and missed NFL running back Jay Ajayi. In the end, Boise finished off 9-4 in his second year. Although it was disappointing they didn't return to the Mountain West Championship Game and they lost three conference games, a 55-7 pounding of Northern Illinois in their bowl game showed how good they could be. Quarterback Brett Rypien returns after a magical debut, and brings with him plenty of offensive talent. If the defense can continue to be stout, this isn't just the best team in a weak conference, they have a very legitimate chance of returning to a New Year's Six Bowl. Backfield: The nephew of former NFL quarterback Mark Rypien, Brett had to fight for QB duties. 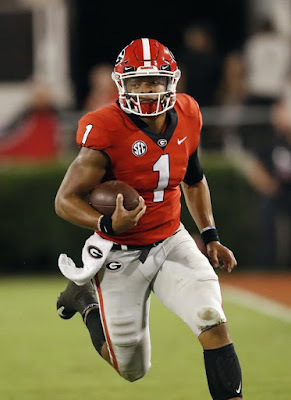 He got a strong push from Ryan Finley and others, but he locked down the gig, and was wonderful. He showed fantastic poise and arm strength, leading to 3,353 yards and 20 touchdowns. Plus, he did it in a conference that has some strong defensive teams, and can actually boast some intimidating environments. The fact of the matter is that Rypien could be even better than he was last year, if he continues to grow. He should be more comfortable with Boise State's talented receivers, but he is also breaking in two new co-offensive coordinators in Zak Hill and Scott Huff after former OC Eliah Drinkwitz left for NC State. He has great arm strength and impressive mobility, which should only grow more this season. I listed him as a breakout player (despite his impressive numbers) only because I think he could become even better, possibly the Mountain West's most complete quarterback. Joining in the backfield is vastly underrated back Jeremy McNichols, who quietly did a great job filling Jay Ajayi's shoes. McNichols used his agility and elusiveness to 20 touchdowns, while showing consistency, averaging 111.4 yards per game in 2015. McNichols also showed amazing ability last season as a pass-catcher out of the backfield, with 51 catches for 460 yards and six touchdowns. Now a junior, McNichols could become even better this season, as he grew plenty stronger this offseason. Expect a number of others players to contribute as well beyond McNichols, particularly senior Devan Demas. Much like McNichols (5'9"), Demas is small and uses it to his advantage, bursting through tough lanes. He ran for 171 yards and two scores a year ago, and he has big play potential. Also sure to see some action is incoming freshman Alex Mattison, a consensus three-star prospect. Mattison was fantastic in high school, running for two straight 2,000 yard seasons at San Bernardino High School in California. If he can bring his wonderful playmaking ability to Boise, the Broncos could have a potential star. Receivers: Helping out Rypien will be the Mountain West's best receiver corps, with tons of talent and experience. The No. 1 option is senior Thomas Sperbeck, one of the most reliable weapons in the nation. Sperbeck had 88 receptions for 1,412 yards with eight touchdowns. Sperbeck was a scary deep threat last season but also showed his ability to move the chains consistently. Joining the experienced Sperbeck will be fellow senior Chaz Anderson Much like Sperbeck, Anderson is gifted with game-changing speed and explosiveness, and he is also a proven route runner. Anderson helped out with 42 receptions and 578 yards last year and continues to grow as a wide out. Beyond those two, Boise will look for some younger receivers to play larger roles. Sophomore A.J. Richardson has all the looks of a breakout candidate. Although inexperienced, Richardson has shown flashes of stardom in his short time with the Broncos, and looked good in the spring. Both Sperbeck and Anderson can stretch the field if necessary, but neither is a real home run threat. Richardson isn't lightning quick, but he possesses decent size and leaping ability to go up and get those home run balls, which will help Rypien out quite a bit. Sophomore Sean Modster is another pretty unproven commodity that could take huge strides in 2016. Modster has good speed and finds ways to create space between him and defenders. Harsin also did a good job on the recruiting trail landing high-upside guys at the receiver position. He went south to land three-star Julian Carter out of Scottsdale, Arizona. Carter has fabulous athleticism and could sneak into the depth chart and make some plays. Fellow three-star recruit Jordan Happle is a deceptively fast player who has a bright future with the Broncos. Boise State is also extremely strong at tight end, thanks in large part to the return of junior Jake Roh. Roh was an All-Conference pick a year ago after picking up 33 catches, 357 yards and one score, and will now not have any competition, as red zone specialist Holden Huff graduated. Roh isn't massive but he is a solid blocker with soft hands. He has to improve in the red zone however, as Rypien needs more consistency from his receivers when the field gets short. Junior Alec Dhaenens may be able to find some opportunities, while incoming freshman John Bates is going to continue to improve. Offensive Line: Boise State doesn't produce a ton of NFL talent in the trenches, but their offensive line is solid every single year because they recruit high quality guys that stay all four years. They should once more be bullies on the line of scrimmage, thanks to four returning starters to their O-Line. It begins on the perimeter for Boise, who brings back two talented tackles, in junior Archie Lewis and senior Mario Yakoo. Both are established in every facet of blocking, with Lewis shutting down pass rushers on the left, and Yakoo patrolling the right side. Neither are insanely athletic but make plays when they need to and are established veterans. Senior Steven Baggett returns to lock down one guard slot, while Travis Averill is the favorite on the other side. Both are great run blockers, and McNichols should have big holes to run through with them leading the charge. Up the middle, Boise is searching for a new center with last year's stater Marcus Henry, moving on. Mason Hampton is the favorite to replace Henry, but will face stiff competition from a number of other young guys. Depth in this unit shouldn't be much of an issue, with a number of linemen being able to help out. Guys like sophomore Andres Preciado and Auburn transfer Will Adams are going to get snaps at multiple positions. Expect newcomers like Kole Bailey (Twin Falls, Idaho) and Donte Harrington to possibly receive redshirts and likely learn from some of these veterans. Defensive Line: There was hope this past winter that Kamalei Correa may stay for his final season in Boise, and not ditch Idaho for the bright lights of the NFL. However, Correa ended up leaving which appeared to be a smart decision, as he was drafted in the second round by Baltimore. While things have worked out so far for Correa, the Broncos will sorely miss him. He was never dominant, but the explosive edge rusher did have six sacks this past season, and was only growing bigger and bulkier. The absence of Correa, Tyler Horn and Armand Nance leaves Boise State very weak and inexperienced up front. That isn't a good thing, but that doesn't mean Boise can't still be strong on the defensive line, as talent still remains. Horn and Nance didn't stuff a stat sheet too full either but were disruptive presences, and new guys like Elliot Hoyte will have to step up. Hoyte is a senior defensive end who had 10 tackles in very limited action last season. While there isn't much stats to back it up, Hoyte has loads of talent, and should become quite the reliable defender this year. Senior Sam McCaskill is the likely starter on the end spot opposite of Hoyte, and is slightly more proven. Both McCaskill and Hoyte have good size and bulked up even more in the off season. Up the middle, first year defensive coordinator Andy Avalos will have to replace Nance's tenacity and heart. Expect either sophomore Paul Semons or sophomore David Moa to start at nose tackle. Moa is the favorite, because of his grit and high motor, but various Broncos will likely find ways to contribute. Harsin also did a good job in recruiting and finding talented young pieces to contribute in this unit. None are five-star, Under Armour All-Americans, but there is plenty of talent and potential. Defensive end Kayode Rufai may be the most talented player in Boise State's entire 2016 class and could see snaps early, while fellow end Curtis Weaver arrives from California with plenty of merit. Linebackers: Not only will the Broncos miss Correa on their defensive line, but they will miss him at the "Stud" linebacker position. Correa's versatility allowed him to play in numerous places all across the front seven, but he was most dangerous and stable at the "Stud" spot, where he played a hybrid end/outside linebacker where he was allowed to run wild. Avalos will be eager to find a player to take over the spot, considering how vital it is to getting pressure on opposing quarterbacks. Even without Correa and solid Tyler Gray, this group could still be the best group on the team, or at least the defense. Senior Tanner Vallejo is an All-Conference talent who had moments where he was absolutely spectacular. He finished off with 52 tackles, with six of them going for a loss. Although not huge or imposing, Vallejo can lay down the hammer on opponents and is still growing to be a complete linebacker. Senior Ben Weaver led Boise in tackles a year ago and is back to keep up that production this year. Weaver finished off with 63 tackles on the year but made his presence felt in other ways as well. He forced opponents to make mistakes, picking off three passes and recovering two crucial fumbles. Weaver is blessed with terrific range and gets all over the field, and the Broncos will lean on him in coverage. Junior Gabe Perez is hoping to contribute at linebacker, but he could also play at defensive end. Perez missed all of 2015 due to injury, and was very limited in the spring. While Boise State will hope to have the talented run stopper back in action, they won't rush him. Sophomore Jabril Frazier has the chance to be really good in 2016, after oozing with potential last season. Frazier is another guy that is plays in the end/linebacker hybrid role, and he could even lock down the "Stud" spot. He showed that he could get to the quarterback last year, with 2.5 sacks as a reserve. Despite the fact Correa got after the quarterback, Boise didn't get much of a pass rush on the quarterback, something that has a staple of their defense during their glory years here. They could certainly turn to Frazier to be that explosive guy off the edge that plays with fearlessness. Senior middle linebacker Darren Lee is going to fight for snaps and brings a proven tackler, while there is plenty of depth at the outside linebacker positions. Secondary: Boise State is not immune to losses in their back-end either, as safety Darian Thompson is gone. Much like Correa, Thompson will be playing on Sundays after he was selected in Round 3 by the New York Giants, who desperately needed his range and playmaking. Thompson proved to be a valuable asset as a run defender and in coverage, but really made his presence felt helping get Boise the ball back, with five interceptions last year. Five interceptions are not easy to replace, but the Broncos have a number of guys that could fill Thompson's shoes, somewhat. Senior Chanceller James is the most talented safety on the roster and the most proven, with 50 tackles and six pass deflections last season. However, sophomore Dylan Summer-Gardner has the chance to be something pretty special. Summer-Gardner hasn't been on campus long but has shown his vast potential in practice and in spring. He has good size and has Thompson's long arms, that allow him to grab the ball and either pick it off or bat it down. He only had 10 tackles last season, but Boise is really excited about what he could be for them. The cornerback spot should be okay, with enough talent back for it to at least not be a serious liability. Senior Jonathan Moxey is going to be the Broncos' No. 1 cornerback. Moxey had 33 tackles and two picks last season and while he does get pushed around a little bit in coverage, he is very solid. Senior Raymond Ford is the likely starter opposite him, and Ford brings plenty of ability to the equation. 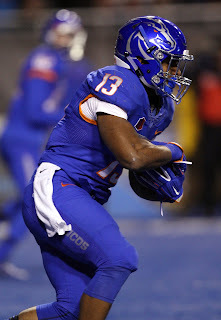 He is another player that showed great play in spurts last year that Boise State is hoping will become more common in 2016. He had two interceptions in limited duties a year ago, so they know he can make plays. Junior Kameron Miles, once a JUCO transfer, and a wide host of others are going to be seeing action as well, particularly Miles, because of his ball skills and the fact he plays safety. Special Teams: Having a good kicker is such an underrated asset to contenders, and the Broncos have a star in senior kicker Tyler Rausa. Rausa knocked down 25 of 30 field goals in 2015, with 59 of 61 extra points. Punter should be in good hands with senior Sean Wale, while McNichols could take over a large role in the return game. Last season was a transition year in Boise and while they were incredibly young, 9-4 was still a little bit disappointing, considering the Mountain Division is not a division of heavyweights. Expect the Broncos to see major improvements in that win total, behind the big arm of Rypien and the pure speed of McNichols and Sperbeck. 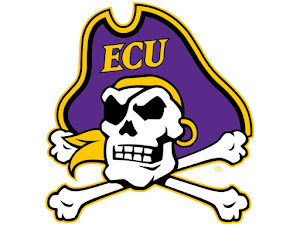 The questions will be defensively, where they have a new coordinator and lose plenty of proven talent. Vallejo and Weaver can help lead things, but it is still a defense that will need a lot of pieces to step up. The schedule is no easy breeze, but there isn't a really brutal part of it. BYU is a tough non-conference team, and Washington State will test their secondary. Oregon State should be a victory, while sneaky Louisiana-Lafayette loses some guys. Overall, Boise State should be a solid football team across the board this year. They should battle with San Diego State for conference supremacy and if things go right, get back to their second New Year's Six Bowl in Harsin's third year.